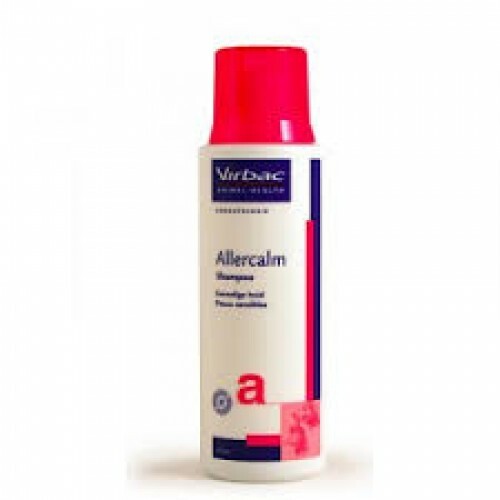 ALLERCALM is a special shampoo with colloidal oat extract for the care of damaged itchy skin. The proven soothing and protective effect of colloidal oats is supplemented by valuable moisturizing, film-forming and restoring substances. The efficiency of this shampoo is enhanced by two major technological innovations: Spherulites and Chitosanid. The spherulites, developed by ALLERDERM, is a completely new capsule system to provide an evenly sustained and controlled release of ingredients on the skin surface. Chitosanid is a natural biopolymer that forms a fine protective layer on the skin and skin surface (film-forming effect). Thus the protective and restructuring properties of ALLERCALM are optimally amplified and soothe the skin. ALLERCALM serves as a supportive measure in the treatment of itchy and inflamed skin in dogs and cats. Application: Shake well before using. Apply ALLERCALM to wet fur. Evenly distribute on the coat and massage until it foams, then rinse thoroughly with clean water. Leave in for 5 - 10 minutes before rinsing, repeat.